Chic paying his fifteen-dollar entry fee to Hacker before teeing off on Sunday morning. No twenties, please. 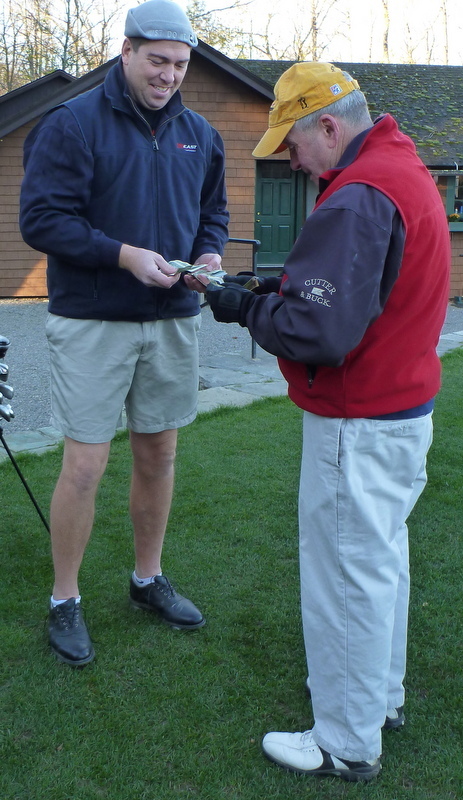 Chic’s shorts (after November 1) earned him one extra handicap stroke. Reese’s hole-in-one bar is on the left. 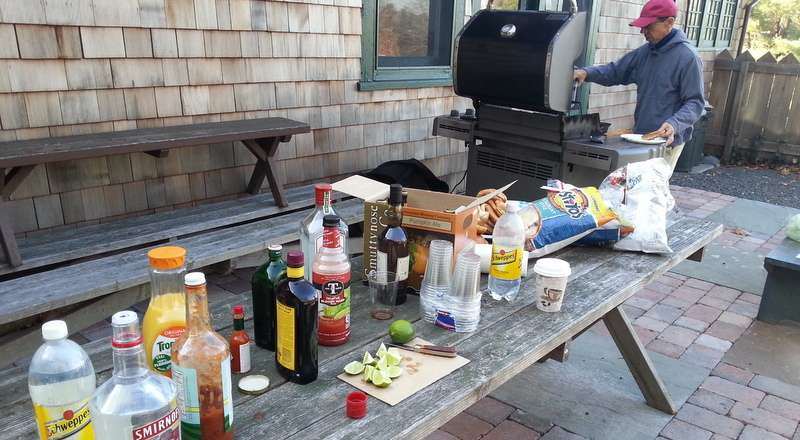 That’s Howard on the right, tending the grill. Lunch itself was provided by Howard. Our town’s grocery store had shut down its hamburger-patty-pressing machine for the winter (for some reason), so Howard had to buy ground beef in bulk and shape our cheeseburgers with his own hands—very possibly the first time that’s ever happened. He also brought two kinds of fancy mustard (but no regular mustard). The fact that Hacker paid out a hole-in-one prize that, technically speaking, no one had earned distinguishes him from much of the rest of the golf world—which, apparently, is always thinking of reasons not to pay up. You can read about several such cases on the website GolfDisputeResolution.com, which covers “the intersection of golf and law” and was created by Rob Harris, a Connecticut lawyer. Harris writes about an especially interesting hole-in-one dispute here. This is what Harris has to say about his own golf: “At the age of 11, on a very hot day, I lost the 9 hole junior boys championship at Tuscarora Country Club on the second hole of sudden death; I proceeded to throw up at the post-event lunch.” Hey, Harris—come join us on Sunday. You’ll fit right in. These two were curled up in the Dumpster during lunch on Sunday. Gary, our superintendent, says they come and go. This entry was posted in Games, Golf Courses, Hacker (real name), Sunday Morning Group and tagged hole-in-one by David Owen. Bookmark the permalink.